UV-cured liquid and powder coatings provide plastic part manufacturers with a number of attractive benefits, including improved performance; enhanced appearance; reduced environmental, health and safety risks; and various process advantages. At the same time, the rapid film formation and densely cross-linked chemistry that characterizes UV-curable materials and provides these benefits also increases the likelihood of adhesion-related failures. Since these coatings often are formulated with little or no solvents to wet out the surface, attaining adhesion is made even more difficult. This paper reviews the adhesion problems common with UV-curable liquid and powder coatings, and explores the tradeoffs associated with popular remedies to adhesion problems. Atmospheric plasma treatment provides an effective means of improving adhesion of UV-cured coatings to a broad range of plastic substrates. Since their emergence in the mid-1970s, UV-curable coatings have gained acceptance as the preferred finishing method for a variety of substrates, including many popular plastics. For instance, nearly all automotive headlight lens assemblies, most commercial eyewear and a substantial proportion of consumer electronics and mobile devices are UV-coated. Recent industry surveys suggest that a number of factors contribute to the popularity of UV coatings compared with conventional thermal curing1. First, UV formulations are popular for their durable surface properties, including scratch and mar resistance. These properties make UV-cured coatings highly desirable for hard surfaces, such as eyeglass lenses, hardwood flooring and DVD coatings. The properties are due, in part, to the high cross-link density common in UV formulations, such as those employing (meth-) acrylate chemistries where the film formation is typically rapid and densely cross-linked2. This high cross-link density increases the hardness of the film. Another property closely related to high cross-link density is physical shrinkage that occurs across the coating’s surface during curing. The monomers and oligomers common to free-radical chemistry shrink considerably as longer-distance Van der Waals forces are replaced by stronger but shorter covalent bonds. The shrinkage causes internal stress, which results in defect formation and dimensional changes3. These stresses and changes in mechanical properties also contribute to reduced adhesion of the film to the substrate. The shrinkage of UV formulations can be as high as 35 percent of initial volume2. Second, UV curing is extremely rapid compared to conventional thermal curing and baking. While many conventional waterborne and solventborne systems require a good deal of oven dwell time, UV formulations cure almost instantaneously when exposed to light4. This makes UV curing particularly attractive for such applications as wood coating, printing, optical fiber coating, graphic arts production and other high-speed processes. The gain in processing speed is even more apparent when comparing UV cure to traditional thermoset powder coatings. Conventional powder coatings require a good deal of time to first melt and flow the powder, and then to achieve full cure through cross-linking. This two-step process commonly can take from between 20 and 60 minutes, depending on the specific powder chemistry and cure oven technology used. While UV-curable powders still rely on heat to melt the powder and form a smooth film, UV energy is used for the curing step. The use of UV with heat can reduce the processing time to less than 10 minutes5. Another desirable aspect of UV-cured liquid coatings is that they frequently use reactive diluents, such as monomers and low molecular weight additives, in place of conventional organic solvents. These components are consumed during the curing process, leading to the claim that these coatings are extremely low VOC or even “100 percent solids” materials. This aspect of UV technology has drawn the attention of environmentally conscious manufacturers and government regulatory agencies6. While reducing solvents has significant health, safety and environmental advantages, the absence of solvents contributes to the potential adhesion problem – since solvents are used to wet out the surface of the part. Powder coatings, like UV-cured coatings, have been embraced as a finishing technology by such regulators as the Environmental Protection Agency. Powder coatings contain no solvents and emit very little to no VOCs and hazardous air pollutants7. However, as with 100 percent solids liquid coatings, the absence of solvents in powder coatings to wet out the surface makes adhesion of powder coatings more challenging, and powder applicators must ensure proper pretreatment prior to powder coating – often with chemical pretreatment. In summary, many of the aspects of UV coatings that provide the most desirable benefits also present formidable challenges to attaining proper adhesion. The rapid film formation and high cross-link density combined with the lack of solvents reduces the likelihood of successful adhesion. Often UV-cured coatings have all of the desired properties, except that they will not adhere to the part. Table 1 illustrates the surface energy of common plastics and the energy needed for adequate adhesion of various coatings. Typically, UV coatings require higher surface energy in order to ensure adequate performance as compared to conventional waterborne or solventborne materials. increasing free energy level of the substrate’s surface by such means as flame or plasma treatment8. Contaminants and soils on the plastic surface can limit adhesion. Finding a suitable cleaning agent, such as a solvent, to remove them is usually the first step. A growing concern with wiping parts manually is worker safety because of increased exposure to harmful or caustic cleaners and solvents, and to the hazardous VOCs emitted by these cleaning agents. Manual cleaning also can be incredibly time consuming. For high-speed processing, it may be more efficient to automate the removal process using such techniques as plasma ablation if the contaminant residue is thin enough. Reformulating the substrate is another option. However, the plastic material often is selected for a number of mechanical and manufacturing properties that need to be matched if the original material is substituted for another. The part design often provides little latitude in finding a substitute that solves the problem, since there are often few substitutes that provide these desired properties or target cost per pound8. Since adhesion problems occur at the interface of the coating and the part surface, only the plastic surface requires modification. Therefore, modifying the plastic resin usually is more costly than modifying the surface, since additives usually are dispersed throughout the entire cross-section of the part. Coating reformulation is another alternative, although it is sometimes difficult to reformulate without trading off other coating properties8. Improvements in adhesion often come at the expense of durability, changes of gloss level and an increase in the cost of the coating. Chemistry suppliers may be reluctant to modify the coating depending on the willingness to pay for reformulation, and the delays often are unacceptable. Also, in cases where the coating already has passed a number of qualification tests, reformulation may require requalification of the material, incurring additional testing time and cost. Another remedy is to incorporate the use of a separate adhesion promoting agent. Adhesion promoters, such as chlorinated polyolefin “tie-coats,” have been developed to assist in the adhesion of topcoats to untreated polyolefin. A thin layer of a dilute solution of a chlorinated polyolefin (CPO) is applied to the substrate using a high solvent concentration. Proper adhesion depends critically on the thickness of the CPO layer. If the layer is too thick, there can be cohesive failure within the “tie-coat.” If too thin, adhesion to the substrate will not be attained10. An effective approach to improving adhesion is to modify the surface chemistry of the plastic. The saturated hydrocarbons that make up much of the polymer’s surface are relatively inert when it comes to bonding with the active species in most coating materials. Improving the adhesion between these two surfaces is a common application of plasma treatment. Good adhesion requires strong interfacial forces by way of chemical compatibility or bonding. Plasma is effective at modifying the surface energy of most plastics. Both hydrophilic and hydrophobic polymer surfaces can be created using plasma. Oxygen used in plasma increases the functionality and the wettability of the plastic surface. Figure 1 illustrates the effect of plasma on increasing the surface energy (mN/m) of a typical polypropylene plastic. The ions, free electrons and radicals produced by atmospheric plasma impact the polymer surface with sufficient energy to cleave the molecular bonds on the surface of most plastic substrates. This cleavage produces free radicals on the polymer’s surface. These free radicals react rapidly in the presence of air to form a number of functional groups. The highly polar functional groups that form and enhance bonding may include carbonyl (C=O), carboxyl (-COOH), hydroperoxide (-OOH) and hydroxyl (HO-) groups. Testing reveals that even relatively small amounts of these reactive functional groups can be highly beneficial to improving surface characteristics and wettability. Beneficial effects of atmospheric plasma treatment have been well established. For example, atmospheric plasma has been demonstrated to be effective in promoting adhesion to polyamide fascia used for automotive interiors11, in the coating of biomedical devices12 and in eliminating both the use of power washing and adhesion promoters for UV-curing applications on plastics13. Recent work has demonstrated the effectiveness of atmospheric plasma surface treatment on a wide range of PC and PMMA plastics substrate panels14. The surface of the panels was activated using atmospheric plasma. The plasma was created with compressed air and applied using a stationary atmospheric plasma head with two rotating nozzles. The panels were coated with a UV Silane-based material, cured using a three-medium-pressure-mercury lamp (120W/cm with 12kW wattage/lamp). The effect of atmospheric plasma surface treatment on the wettability of the polymer surface prior to coating deposition was followed up by measuring contact angle – a reliable means of determining surface energy. The contact angle on the PC substrate was 80° ±2° before treatment and 43° ±1° after plasma treatment. The PMMA contact angle was 65° ±2° before and 55° ±2° after plasma treatment (Figure 2). This work has demonstrated that atmospheric plasma treatment successfully removes organic contaminants on the surface of the plastic and causes simultaneous surface oxidation. The free radicals that are produced combine with active species from the plasma to form such polar groups as –(C–O)–,–(C O)– and –(C )–O– on the substrates surface. The substantial decrease in contact angle reflects a significant increase of surface free energy and results in greater adhesive strength between the polymer and UV coating. UV powder coatings, commercialized during the late 1990s, extended applications for powder coating beyond metal goods into markets using heat sensitive substrates, such as plastics and wood. These UV powders combine the cost efficiency, durability and environmental compliance of powder coatings with the faster speed and lower temperatures afforded by UV cross-linking15. While acknowledging the potential benefits of UV-cured powder coatings for a range of applications, the difficulty of achieving adhesion of the materials also has been recognized16. To help provide the needed adhesion, some applicators have turned to using a liquid primer prior to applying UV powder17, 18. We have examined the effect of atmospheric plasma surface treatment on the performance of a UV-cured powder coating on a wide range of popular plastic substrates. Atmospheric plasma treatment is environmentally friendly and a safe alternative to traditional cleaning methods. The active species in the air combine with UV energy to produce a chemical reaction with surface contaminants, thereby eliminating the need to manually clean the plastic. Atmospheric plasma treatment cleans the part surface by removing fine contaminants and increases the surface energy of the substrate. This article demonstrates this effect on test plaques composed of various blends of polypropylene, ABS, polycarbonate, ABS/polycarbonate and Nylon 6 were used. Identical plasma surface treatment was done on each test panel at 20 FPM using a single nozzle Plasmatreat Openair® RD1004 rotating nozzle system. Following the plasma surface treatment, a thin (10-12 micron) conductive coating, such as Chemical Technology Inc. CTI-4386 or CTI-1693, or similar product, was spray applied to promote electrostatic attraction of the powder coating. An acrylated polyester UV-curable powder coating was applied electrostatically with a nominal film thickness of 50-60 microns (2.0-2.4 mils). The test panels were placed in a 110°C (230°F) convection oven for 10 minutes. This dwell time was sufficient to allow the powder coating to melt and flow out smoothly over the substrate surface. The powder-coated panels were UV-cured using a gallium-additive mercury lamp (Fusion, 300W/in). Cure was confirmed using 50 double rubs of methyl ethyl ketone (MEK) with no measurable loss of gloss on a 60o gloss meter. At ambient temperature, the adhesion of the powder coating on each panel was evaluated using standard test method ASTM D 3359. The results of this testing is shown in Table 2. These findings are important in several ways. First, plasma treatment has a marked effect on adhesion properties for a number of popular plastic substrates. For example, while polypropylene, ABS and polycarbonate had no adhesion without surface treatment, they exhibited very good adhesion following the atmospheric plasma treatment. Second, there is variation within these results that warrants additional process development. For example, the polypropylene tested according to this method did not produce the same level of adhesion as obtained on ABS or ABS/polycarbonate blends. (See Figure 3). Further improvements in adhesion can be achieved with refinement of the surface treatment process and modifications to the powder melt/flow process. This highlights the need to optimize the process through laboratory testing prior to deploying a “stock” solution to the production floor. Finally, some coating and substrate combinations – e.g. the ABS/polycarbonate blend used here – sufficiently works well without surface treatment, so the process provides little added benefit. Finally, some substrates – e.g. the Nylon 6 tested here – did not show sufficient adhesion even with plasma surface treatment. This test regimen intentionally used a standard UV powder formulation and the same surface pretreatment method to test the robustness of the UV powder coating process on plastics. Under these conditions, we consider the result that four of the five substrates were successfully powder coated with good adhesion. In three of the four cases, atmospheric plasma surface treatment made the difference between an acceptable and unacceptable process. In future work, it would be reasonable to try other powder coatings and to vary other process conditions, such as the melt/flow speed and temperature to optimize the adhesion; to find a combination that also will provide better adhesion to Nylon 6; and to extend the testing to a wider range of substrates, including BMC, PET, Nylon 66, SMC and others. UV liquid and powder coatings continue to attract plastic part producers because of their excellent surface properties, low-heat, high-speed processing and environmental compliance. UV-curable powder coatings offer these benefits to powder coating, a technology recognized for its durability, and economic benefits owing to the efficiency of being able to reclaim oversprayed powder coatings. However, many of the properties that provide these benefits to UV coatings also make adhesion to low surface energy plastic surfaces more difficult, and delamination of the fully-cured paint film is a common occurrence with insufficiently prepared plastic substrates. While various means exist to improve adhesion, such as reformulation of the coating or plastic, these are time-consuming and costly approaches. Other techniques, such as manual cleaning, are impracticable for high-speed automated processes and require workers to handle frequently harmful solvents and dangerous VOCs, which present both health and environmental and safety concerns. In this article, we have explored the role of surface treatment using atmospheric plasma treatment for overcoming difficult adhesion encountered with UV liquid and powder coatings. We found strong empirical evidence that atmospheric plasma is effective at enabling UV liquid coating adhesion. There is compelling evidence also that atmospheric plasma surface treatment may provide a robust solution to applying UV powder to plastics. While some work remains to be done in this area, our initial results demonstrate that atmospheric plasma treatment of substrates yielded acceptable or promising results on otherwise uncoatable surfaces in all but one substrate tested using a standard powder coating developed for general plastics application. The use of safe, cost-efficient and environmentally friendly atmospheric plasma appears to be an efficient means for improving the performance of liquid and powder UV coatings for a growing range of plastic applications. The authors wish to thank Kevin Biller and the research staff at the Powder Coating Research Group, of Columbus, Ohio, for their help with the UV powder coating tests presented in this article. Schwalm, R. (2006). 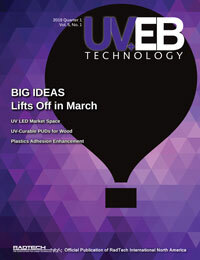 UV coatings: basics, recent developments and new applications. Elsevier. Jian, Y., He, Y., Jiang, T., Li, C., Yang, W., & Nie, J. (2013). Volume shrinkage of UV-curable coating formulation investigated by real-time laser reflection method. Journal of Coatings Technology and Research, 1-7. Schwarb, R., Knoblauch, M., (2011). New Opportunities for UV-Curable Powder Coatings UV-curable powder coatings continue to grow in demand. Coatings World, November 2011. Oehr, C. (2003). Plasma surface modification of polymers for biomedical use. Nuclear Instruments and Methods in Physics Research Section B: Beam Interactions with Materials and Atoms, 208, 40-47. Gururaj, T., Subasri, R., Raju, K.R.C., Padmanabham, G. (2011). Effect of plasma pretreatment on adhesion and mechanical properties of UV-curable coatings on plastics. Applied Surface Science, 257(9), 4360-4364. Andy Stecher is president and CEO of Plasmatreat North America (PTNA), a subsidiary of Plasmatreat GmbH in Steinhagen, Germany. His executive-level experience in manufacturing organizations spans nearly 30 years and includes such positions as vice president of operations at RATIONAL North America and CFO /general manager of HARTING, Inc. of North America. Contact Andy Stecher at andy.stecher@plasmatreat.com. Paul Mills is an industry consultant specializing in the application and curing of UV-curable paints and coatings. He has been involved with UV curing and RadTech International North America since 1994, and he has been providing expertise to suppliers of UV-curable raw materials, formulations and process equipment since 2002. Prior to that time, he was vice president of sales and marketing for Nutro Corporation (now Venjakob). Contact Paul Mills at pmillsoh@aol.com.